What every gal want: Who's ready for Bag of Love?! Who's ready for Bag of Love?! Above is the Bag of Love, I am sure you know what it's all about. :D Yeah itchy hands wanna know what's in Bag of Love every month. 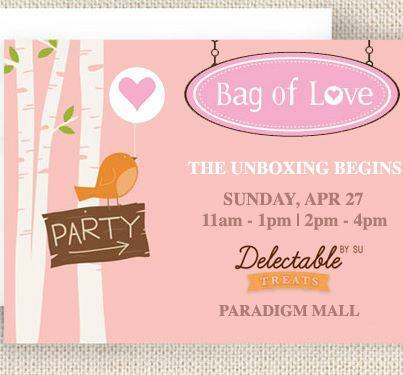 Fifty (50) bloggers from Malaysia will be selected to review Bag of Love's April Edition. YES YOU ARE READING THIS CORRECTLY! I Mean selected bloggers get to have their hands on the Bag of Love's April Edition!! You know it I hope I get the chance to review the Box of Love! Out of the fifty bloggers, thirty (30) will receive exclusive invitations to the Unboxing Tea Party held at Delectable Su, Paradigm Mall on 27th April, 2013 at 11am (session 1) or 2pm (session 2). If you like to join this fun exciting Bag of Love: The Unboxing Begins click detail here.